Where are the best Fortnite llama locations? 2. Can The Good Place keep its halo as the most heavenly comedy on TV? 3. Will Bradley Cooper’s directorial debut starring Lady Gaga generate awards buzz? 4. Which new skin in the latest Heroes of the Storm event are you hoping to score? 6. Does FIFA 19 add enough to justify its yearly iteration? FIFA 19 The Journey rewards and ending: what do you get for finishing each chapter? 7. Can a movie about a haunted house attraction ever be as much fun as the real thing? 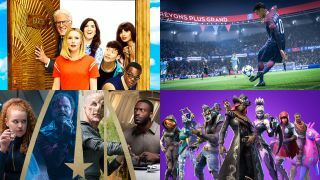 8 Things to Watch This Week picks the best games, movies and shows of the next seven days every Friday at 9am PDT / 5pm BST.